According to a recent analysis by the Century Foundation, during the recession and recovery Cleveland transit riders endured more bus service cuts than any other major system in the country. But just a few years later Cleveland transit riders are facing further cuts, and a fare hike to boot. A bad economy, an unfriendly state government and a steady trickle of Cleveland sprawl are killing the system, which is by far the most robust in the state of Ohio, RTA General Manager Joe Calabrese said at a mobility event Wednesday. When Joe Calabrese left Central New York RTA to take the helm at Greater Cleveland Regional Transit Authority 16 years ago, 1.392 million people lived in Cuyahoga County, where they provide 1 cent on every purchase to support RTA operations. The sales tax contribution covers more than 70% of RTA’s operating budget, but has been sliding since 11 separate transit companies merged under the regional banner in 1978 when 1.539 million county residents contributed. A one-two punch of job losses and sprawl has dominated Calabrese’s tenure as CEO and general manager, the longest of any major, U.S. transit system boss, according to his introduction at today’s Hope for the City: Mobility Matters series at the Old Stone Church in downtown Cleveland. By 2010, another 100,000 people had left Cuyahoga County and wouldn’t be supporting RTA with its purchase power. When the U.S. Census came out, RTA would also have to contend with the federal government trimming $3 million (based on population size) from its budget. 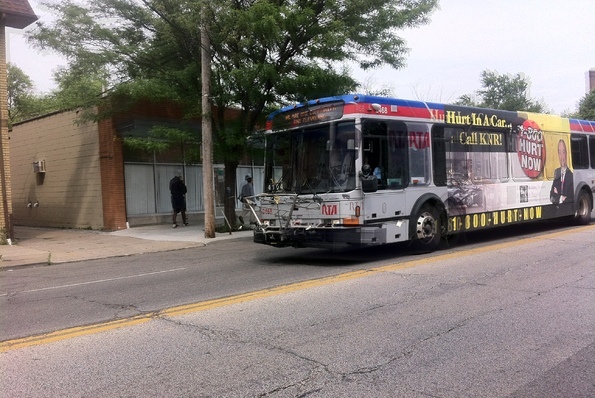 Reeling from the recession, RTA faced possibly its worst year of revenues. Meanwhile, Ohio lawmakers had an opportunity to ride in and preserve RTA, the largest transit system in the state and in the Top 20 in the country. Ohio refused Calabrese’s modest proposal to increase its funding support 3% per year, and RTA was forced to make deep cuts. Meanwhile, state support for transit has dwindled from $43 million a year at the beginning of Calabrese’s tenure to just $7 million today. RTA’s share of that is a measly $225,000. Elsewhere on the Network today: Seattle Bike Blog says the city should fix its struggling Pronto bike-share system by expanding it. Bike Portland reports city leaders are going to stick taxpayers with a $26 million bill for a parking garage right next to a light rail station. And Move Arkansas reports opponents of the expansion of I-30 in Little Rock have hired an independent consultant to evaluate the state’s case for widening. Grassroots volunteers are making progress in their campaign to reverse Cleveland's transit death spiral. But the fight's far from over.